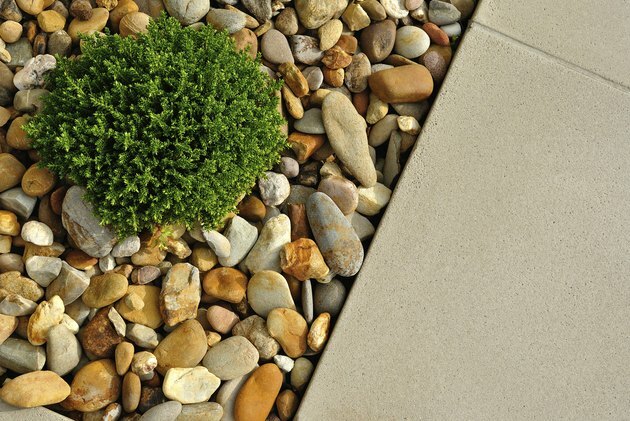 The purpose of spraying landscape rocks with Thompson's Water Seal isn't to waterproof them but to give them the appearance of being permanently wet. The paraffin oils in the product soak into the pores and give rocks an appealing dark, glossy sheen. The manufacturer doesn't recommend thinning this waterproofing product, but you shouldn't have to; it's thin enough to spray with a garden sprayer right out of the can. You can spray rocks in place unless there's a chance they will be moved regularly; in that case, you may want to spray each one individually. Spraying rocks with Thompson's Water Seal simulates a recent rainfall. Clean any obvious dirt off the rocks you want to treat either by brushing them with a broom or, if they are particularly dirty, washing them down with a garden hose. Wait until they are completely dry before proceeding. Work on a dry day when no rain is in the forecast for at least 48 hours. The temperature should be above 50 degrees Fahrenheit. Cover the lawn, sidewalks and any plants or shrubs surrounding the rocks with plastic sheeting. Pour Thompson's Water Seal into your garden sprayer, filling the container about three-quarters full, and screw on the lid. Don't add thinner. Tighten the spray nozzle and pump up the sprayer until you get a pattern of fine mist. Spray the rocks until they all appear uniformly wet. You only need a single coat -- extra coats aren't recommended. Pour all remaining product back into the can when you're done spraying, and clean the sprayer with soap and water. Wash out the container and spray the soapy water through the nozzle. Rinse with clear water.